Nancy and I are in Cleveland and RNC 2016 is really about to get underway for us. Also a little housekeeping in case you were to hear a radio interview I did. In talking about some of the floor action tonight, I said “no one walked out”. First, I had no idea from the floor that the Colorado and Iowa delegations had walked out. Second, no one from the Texas delegation left. How this solid pro-life, pro-limited government, pro-second amendment person can vote for Donald Trump. In 1990, I started out as a prosecutor in New Mexico prosecuting everything from DWI to capital murder. Somehow, I found the time to get involved with the local Republicans in 1992. In 1994, New Mexico had their gubernatorial elections coming up and Nancy and I decided to hitch our wagon to one of the horses in the race. Our choice was Richard Cheney – a former state representative from Farmington. There were three other candidates for the GOP nomination for Governor including our eventual friend (and future Republican Party of New Mexico State Chairman) John Dendahl. There was also a new name running for the nomination. When I was called and asked about supporting this new guy, I resisted because I knew nothing about him. I knew nothing about his policies. I had nothing to gauge his pro-life record on. I also did not care for his campaign manager on a professional level. Although this new guy was a self-made millionaire from a business that he started, he had no legislative track record to measure how conservative he was. I remember that there was a discussion that he grew up a son of missionaries; however, it was not clear where he stood with his faith. I will also note that during the primary, he contributed a lot of his own money to make sure that he won the primary. Some say that he bought the primary. Nancy and I liked our pick – Richard Cheney. Nancy and I threw one huge fundraiser at our house in Hobbs for him. We really liked his campaign manager Pete Rahn (who went on to later run the Department of Transportation under the eventual Republican nominee and future Governor). Unlike the other guy, Cheney had a proven track record on the important things – a good record. He had a solid pro-life, pro-business, and pro-second amendment voting record as a legislator. And, he clearly expressed where he stood as a Christian. During, the primary season, he also contributed a lot of his own money to make sure that he won the primary. Not as much as the eventual nominee, but he did spend a lot of money on the primary as well. In case you have not figured it out yet, that other guy and eventual GOP nominee was Gary Johnson. On June 7, 1994, Republicans made their choice. In the four-way primary, Cheney lost the primary to the Johnson 34.48% to 33.10%. Because New Mexico does not handle their primaries like Texas does, Johnson won the GOP nomination for Governor despite the fact that over 65% of the people voted for some other candidate for the Republican nomination for Governor. After the dust of the primary settled, many New Mexico Republicans, wondered if they could get behind this unknown Republican and support him. While he was a likeable guy, the question was could we, as Republicans, trust him? Nancy and I were not happy about the choice of Johnson as the Republican nominee for Governor (he was our third of fourth choices), but we decided to give him the opportunity to serve because: 1). he was the choice of the Republican voters and we respected the electoral process; and, 2). he was infinitely better than the popular, incumbent Democrat Governor. We all know the rest of the story. Johnson won the 1994 gubernatorial election with less than 50% of the vote. He did so because Green Party candidate Roberto Mondragon, the incumbent Governor’s prior Lt. Governor, received more than 10% of the general election vote. I see the 2016 race for President the same way that I see the 1994 Republican race for Governor. Donald Trump is the outsider who won the Republican primary using a lot of his own money in the process. However, in a much more crowded primary field than Johnson, Trump has won 34 states with four more contests to go. Like the 1994 Gary Johnson, the 2016 Donald Trump is infinitely better than all of the possible Democrat nominees. Finally, the best that Gary Johnson do in the 2016 November General Election is be a spoiler to the Republican ticket. Let’s look at this last point for a second. Gary Johnson is like the 1994 Green Party candidate Mondragon. Johnson has a great chance at spoiling the race for Trump as Mondragon did for King. However, not only is Johnson unlikely to win any electoral votes; it is very likely that Johnson will not be able to get a nation-wide threshold vote of 10% (Johnson got just 1% of the popular vote and no electoral votes four years ago). I also note that as of May 6, the Libertarian Party is only on the ballot in 32 states. My problems with Johnson go further in that Johnson is not the same person he was in 1994. His current platform is much different than the one he ran for as Governor in 1994 and in 1998. Johnson’s platform for President as a Libertarian is not even true Libertarian in many areas. His running mate is even less Libertarian than Johnson is especially in the area of the second amendment. I think that conservatives like me can support Donald Trump for President. I can do it in good conscious because I am giving Donald Trump the same opportunity that I gave Gary Johnson in 1994. This column appeared in print at the Republican Party of Texas state convention this past week in Dallas. The column was featured in the El Republicano newspaper, which was published by the Federation of Hispanic Republicans. While I have not mastered the art of playing blackjack, I have come to understand the concept of “Basic Strategy” and why it should be followed by everyone who is on the same table as you are. For those who are not familiar with Basic Strategy in blackjack, it is summed up like this: There are strategic times when playing blackjackagainst the house that it is appropriate to hit, split, double down or stand when your cards are compared to the dealer’s up card. By using Basic Strategy, in the long term, a player can pick times to time a bigger bet against the dealer when there is an advantage over the dealer. There are at least two components of implementing Basic Strategy when playingblackjack. 1). The player does not pin all of their hopes on one hand, and; 2). All of the players at the table must be practicing Basic Strategy in order for everyone to have the opportunity to beat the dealer. That is when the idea of this article hit me (pun intended). The 2016 presidential primary is just like one hand out of one shoe in a session playing blackjack. The times that I have successfully played ablackjack session are those sessions that have involved several hands from several shoes. When you are seriously playing the game, it can be a real slog. While I never like getting beaten on a single hand, some in politics act like they never knew the rules of the game before they sat down to a table at which they chose to play. But, as in blackjack, Republican convention politics necessitate that you know the rules before you sit down and play. To play and to not know the rules, as in all aspects of life, is a perilous endevaor. I have won and lost playing blackjack. Each session involves playing through many single deck and double deck shuffles and also the multi-deck shoes. Some sessions are better than others. Did I win every hand? No, that is not to be expected. Did I come out a winner in every shoe in those sessions? No, that is not to be expected either. Did I have some “bad beats” in those hands? Oh Yeah! But at the end of the session, I always came back to the conclusion that I had a better chance of coming out a winner because I stuck with the Basic Strategy. I stuck to it even after I placed my bet and I “knew” that I was going to get beat after doubling down on an eleven and drawing a four to the dealer’s nine card. I just waited for the next hand. Additionally, I have noticed that when there are several players at a table and there is one player who does not use Basic Strategy, it tends to jinx the whole table. I cannot count (pun intended) the number of times that I have doubled down on a large bet for the third baseman to not follow the simplest of basic strategies (like not taking a card with a soft fourteen to a dealers nine card). My experience tells me that every player at theblackjack table must play Basic Strategy for the best chance at a profitable session. The Basic Strategy in politics is to stick with the current process though it may not result in wins for everyone at the table. What many people fail to realize is that the game rules are set way in advance of the cards being dealt. For example, Trump complains that Cruz is stealing all of his delegates. What Trump fails to mention is that all of the rules that he is complaining about were set in place well before the primaries were held. The solution is not changing the rules in the middle of the game but playing the hand that we are dealt and not walking away from a great 6-deck shoe (the overall Republican message). After the November election period shoe, Cruz should lobby for closing the Republican primary to only declared Republicans. Trump should lobby for a more transparent delegate selection process. But here is where the analogy breaks down. In blackjack, I always have had the option of not playing or playing at another table. The option of not playing or changing tables is not an option for us devoted to conservatism in politics because to do so would result in multiple Democrat victories across the board. Not just in November, but in every election. Many people smarter than me agree with me on this point. Honestly, I have not been thrilled about some of the past Republican Presidential tickets. I have a strong sense that I will not be thrilled about the 2016 ticket. Despite the Presidential ticket, I believe that a Conservative Republican Basic Strategy can win this November no matter who is on it. The ticket won’t always win, but in the long run, it is the moral and right game plan. That is why I am unconditionally supporting the Republican Presidential ticket. I close with this thought. Committing to playing Conservatism Politics consistently, despite setbacks, is the Basic Strategy mindset that the conservatives of the GOP need to play for long term political wins. Will we win every election using this strategy? No. Even the Reagan landslides of the 1980s did not produce 100% winners. But, it did produce overall wins. Conservative politics is the game that many of us conservatives have anted up and signed up for. Let’s stick to the Basic Strategy and support the eventual Republican nominee no matter who it is. Let’s play the cards that we are dealt. Unless we all play the game the same way, we will all lose. The current hand is not over until November. And I think that Hillary is going to bust. I am not sure exactly how I became aware of the circumstances of the events in the race for State Representative in House District 81, but I do know it was fairly recently when I realized that Mr. Landgraf was repeatedly lying about his record and accomplishments as a state representative. I came to this conclusion in two ways. First, during the 84th General Session, I was the General Counsel to a Republican State Senator while Mr. Landgraf was serving as a freshman state representative over in the House. I know for a fact that many of the actions and accomplishments that he is trying to take credit for are just not true. Second, as a trained investigator, I have carefully read and listened to his statements and realized that what he was writing and saying was also just not true. For example, he wrote in a guest column for the Odessa American (OA) that he is fighting to repeal the Robin Hood funding formula and that he was making great progress in this endeavor. Specifically, he wrote that “I filed a bill in the Texas Legislature to repeal the Robin Hood law.” The problem is that Representative Matt Rinaldi filed HB 945, not Mr. Landgraf. He signed on 23 days later as a co-author (which means he was an official cheerleader for the bill). He did not draft or organize anything having to do with the bill, yet he tried to take credit for writing it. When I confronted Mr. Landgraf in an open forum on February 15 about the lie, he admitted that he did not file the bill. In his admission, he failed to explain why he lied. He also failed to explain to the audience that the Robin Hood school funding mechanism remains subject to a Texas Supreme Court Order. And since it is subject to a court order, any changes to the current school funding mechanism cannot be dealt with solely by the Legislature. In fact, there is pending litigation regarding the Robin Hood funding that would make any filed bill irrelevant. Later that day at a different forum, he again commented about the status of the Robin Hood funding formula and insisted that the Legislature could do away with Robin Hood. Again, this is simply not accurate. After looking into the media’s coverage of this race, I recognized that the OA was being a bully to Mr. Landgraf’s opponent. Not only have they failed to cover Mr. Landgraf’s lies about his own record, but they’ve done so while simultaneously and aggressively challenging the views and opinions of his opponent. In response to this, I sent the OA very specific, credible evidence that Mr. Landgraf had lied to the voters on several matters (including the Robin Hood bill). The OA did not investigate my evidence, nor did they ask Mr. Landgraf about my evidence. On February 19, the Publisher of the OA stated in response to a February 18 social media posting that I had no business pointing out a politician’s lies and cover ups and that only a candidate’s opponent should be able to point out the things that I was trying to point out. My first response to the Publisher’s comment is, “Wow, I am sure that President Nixon would have wished that Woodward and Bernstein felt that same way as you do.” If it were not for a person with insider knowledge about the Watergate scandal and the subsequent investigating and reporting by the Washington Post, the public would have never known about it. My second response to the Publisher is, “What difference does it make who brings forward facts of a public servant lying about their record and accomplishments as long as the facts are brought out?” The knowledge of a politician’s lies is not always in the possession of the politician’s opponent but by someone who was present when the events occurred. In the case of Mr. Landgraf, not only was I present for part of the events to which he refers to for his successes, I know enough about the Texas Legislature and people connected to it to be able to find the real truth about his statements and claims. My third response is, “Just how much credible evidence is necessary to bring to the media for them to at least ask Mr. Landgraf a few in-depth questions about those allegations and then report his responses to those allegations?” The February 14 editorial in favor of Mr. Landgraf made it clear that the OA aggressively pursued any perceived misstatements or inconsistencies of his opponent. And, remember that forum that I mentioned earlier where Mr. Landgraf admitted to lying about filing a bill to repeal the Robin Hood law? Well, the OA did not cover that he admitted to that lie. And, as of today, no one in the media has asked him a follow up question about that lie. My concern of media bias on behalf of the OA was further confirmed in that same social media posting of February 19. 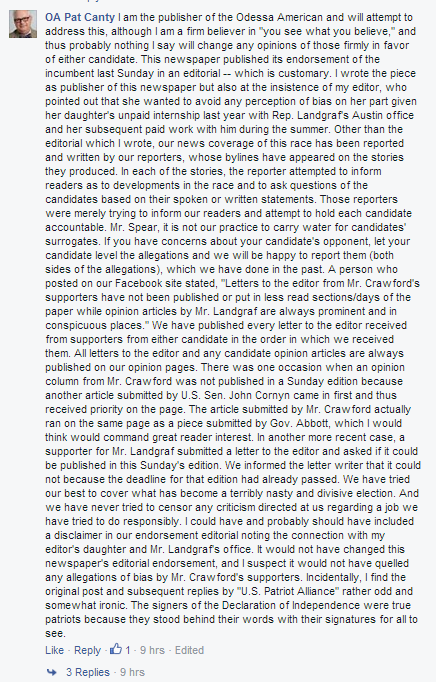 In the same comment, the Publisher confirmed that the daughter of the editor of the OA had not only worked for Mr. Landgraf as a volunteer for his campaign, but had been a paid staffer of Mr. Landgraf in his capacity as a state representative. No mention of these entangled relationships was mentioned when the OA endorsed Mr. Landgraf. Nor has there been any further mention of it by the OA other than that one posting in social media. Separately on February 15, I also provided to CBS 7 specific credible evidence that Mr. Landgraf had lied on two matters. After hearing no reaction from them, I contacted them again on February 19 and provided specific, documented evidence of additional matters how he lied about his record and accomplishments. For example, I pointed out that at the OA/CBS 7 evening forum, he claimed full credit for fixing Hwy. 302 between Notrees and Kermit. The incredible thing about this accomplishment was that it was completed in the middle of the 84th Session. This claim is so outrageous on its face that no additional documentation is necessary. Those involved with road projects know how long it takes to plan, fund and then schedule these types of projects. The other four occasions were extremely well documented to the point that any reasonable journalist would have called any other candidate to inquire about the allegations. As of February 24, it appears that none of those issues have even been raised by CBS 7 with Mr. Landgraf. They certainly have not been reported. Interestingly, Mr. Landgraf’s wife was briefly and recently employed at CBS 7 in the middle of the current primary. Nor has that been disclosed to the public. I am well aware of the dangers of starting a war with someone who buys ink by the barrel, but I don’t care. I appreciate the importance of standing up against bullies and standing for those who are being treated wrongly. While I may not and do not agree with every platform position that Mr. Landgraf’s opponent has taken, I think that his opponent has been treated worse than wrong by the media. I haven’t given his opponent a dime, yet Mr. Landgraf has benefited from the free favorable media coverage. The favorable coverage is so prevalent that it is apparent that they have championed Mr. Landgraf and that they are trying to shove that champion right down the voters’ throats. In this particular case, the media has forsaken its’ obligation to educate and illuminate issues for the public. This should be reason enough to vote against Mr. Landgraf and for his opponent. Yesterday, I took the time to appear before the Midland City Council and I challenged them on why they wanted to add $39 million to our current $138 million debt by building a new city center. Note: At the time, the council had not taken a final vote on which option to pursue. In fairness to the council, I chose a lower number to illustrate my point. But now it appears the council wants to spend $42.5 million on a new city center. This $42.5 million is intended for a new city center that would last at most 30 years and probably barely cover its own maintenance and operations costs by the fees it charges for its’ use. I was saddened to see that I was the only one to address the City Council one way or the other on this matter. If you read my comments and you agree with me, please call your city leaders and let them know that you want them to put the brakes on this boondoggle. Below are my comments assuming that the council was going to go with a lower project estimate. My name is Nelson Spear. I live at 7010 Almey Ct., Midland, Texas. I come to you and challenge you on your reasoning on spending $39 million on a new Midland Center. With that said, I once again I point out that, many of us have been urging all of our elected officials to pay down government debt especially in the years that the income is blowing and growing. Indeed, most of you ran on fiscal conservative and transparency platforms. As some of us know, Midland’s current debt is almost $138 million. Out of all Texas municipalities, Midland currently ranks Forty-Fourth out of 1,216 municipalities in overall debt. If you add the $39 million projected debt to the current debt, Midland’s rank for debt goes from Forty-Forth to Twenty-Ninth for a debt of $177 million. These numbers come directly from the state comptroller. That is a debt of about $1,380 per person in the city. That is a 28% increase in debt. Also, you all are talking about another $33 million in certificate of obligation projects that you want to do. 1. That plan called for the use of eminent domain. If the current plan involves the use of the eminent domain, I am going to be pretty upset about that. 2. The cost of the plan then would have required 18,000 visitors per year to generate the income necessary just to pay for the project. I got to that figure by taking the $39 million project and giving it a 30-year life. Please delay your spending plans on this project. Here is how you contact your city leaders. I am both honored and humbled that I just got honored with a full profile by Texans For Fiscal Responsibility. Please take a look at the profile here, and consider sharing it with your friends. At this time of year, I and other Christians reflect on the “Christ” in Christmas. So what does that really mean reflecting on Christ? Over the years, it has meant several different things to me. Yet, it always surrounds some kind of concept of gifts. Naturally, as a Christian, I think of the free and unconditionally offered gift of Jesus Christ. As I have gotten older, it means that receiving a physical gift has become less and less important. I am not sure that my motivation was the “It is more blessed to give rather than receive” thing. But, giving an unconditional, unexpected gift to someone has become a great joy to me. This year was different. It was a harder year than normal for the Nelson Spear family. Admittedly, I was feeling a little down. Then, just yesterday, I received my gift. As I was driving around town running errands for Nancy and Dan, I had the opportunity to encounter and engage with dozens of people. It was then that I saw that everyone was purposefully projecting a positive spirit. To describe it as a spirit of unconditional love and giving would not do justice to the feelings that I was picking up from everyone that I encountered. My gift was seeing this sacrificial feeling from everyone. To say that I felt convicted would be an understatement because I knew without a doubt in my heart that this feeling was “Christ”mas based. My gift of being able to see the good in people, as Christ did, will not be a wasted gift. Even when people do bad things, I will look for the good. I will look forward to a fantastic 2016. Three arguments why we should not bring the Syrian refugees to the U.S.
We all have been bombarded by the MSM and those who support unconditional access to the United States by the Syrian refugees. Those of us who are vocally opposed to the relocation of refugees who have not been vetted for security risks have been demonized as anti-immigrant and/or selfish. I suggest that almost all of us who are opposed to this Syrian refugee relocation program are opposed to the relocation for several reasons. For me, here are just three broad based reasons. 1. The United States of America simply does not have the resources to care for the refugees here in the United States. I have yet to see an explanation how bringing the refugees here to the United States is the best use of financial resources. And, while the United States has historically and sacrificially helped many nations and peoples in times of trouble, the United States needs to take care of its’ own family first. While our budgets running at enormous deficits, we still have not cared for those who made our freedoms and peaceful holiday possible. With so many homeless and hurting veterans, we need to focus and tend to their needs first before we go trying to help other nations with their needs. 2. While I do understand that most of the refugees cannot remain temporarily within Syria, the policy of relocating them here within the United States is not clear to me. First, by bringing them to the United States, it creates a permanent resettlement for them that does not need to happen. Civilian displacement is always a casualty of war and civil war. Once the conflict is over, it is a better policy to have those displaced indigenous populations to return to their original homes once the conflict has ceased. Second, by not requiring the neighboring countries of the Syrian refugees to step up and participate in helping in the housing and care for these people, you further disrupt the refugees’ cultural identity. Keeping them close, but safe, to their ancestral home provides hope of returning to a place they know. Further, the neighboring countries which are more culturally aligned with these refugees than the United States are better destinations than the United States. I fully realize the problems that the Sunni Muslim and Shia Muslim nations have with helping and receiving help from one another. But, at some point these two sibling groups need to grow up and get along. This is the perfect opportunity. The United States should not enable the sibling rift. The United States needs to use its’ influence to push both sides to cooperate with each other. 3. There has been much blowback from those who do not see that bringing in Syrian refugees is a national security threat. Some of the arguments that there is not a national security threat include quotes from our President. However, the President’s own people have stated that there is a national security risk. For example, FBI Director James Comey stated regarding the challenges of screening Syrian refugees, “We can query our databases until the cows come home, but nothing will show up because we have no record of that person…You can only query what you have collected.” Fortunately, Congress has stepped up and conducted an inquiry. The House Homeland Security Committee issued a preliminary finding that there is a grave national security risk by bringing in unvetted refugees to the United States. The same committee recommended that all admissions of Syrian refugees be suspended until there is a mechanism to screen out those refugees with terrorism ties. These are just three reasons that I came up with. I am sure that you all can think of more. So, the next time someone thinks that you are anti-immigrant or selfish, present these arguments to them. My guess is that they cannot refute any of them.